Source Around the home or the local hardware and second hand shop. Birds are cautious and scared of people in general. So when we are outside we can scare the birds away. Unfortunately we can’t stand outside scaring the birds off our lawn or garden, 24/7. 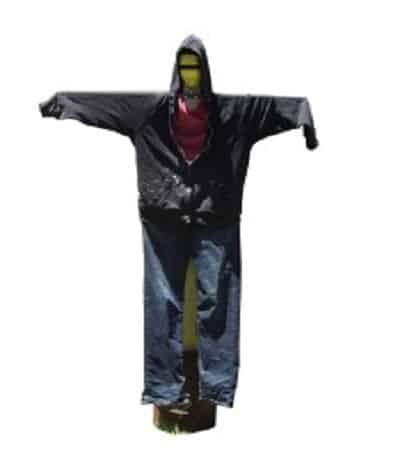 So the scarecrow is the next best thing, a replica of a person standing outside giving the birds the impression that someone is there and to keep away. Quite simple, been used for sentries, but does it work? ‘Football face’ took me a bit less than an hour to set up. He is a piece of pine stud (215mm long) for the spine, and two pieces of spare decking that were left over from a recent renovation (cut to fit my old clothes). The decking was cut to size and screwed onto the pine stud. 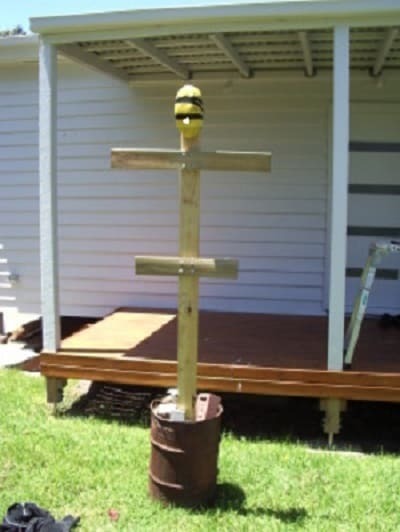 To support the scarecrow I placed the bottom of the stud into an old drum I had lying around and threw some bricks in to keep him upright. I made sure that the old clothes fitted the frame as I went, saving any embarrassment and extra time later on. Last thing was to tape on the football, and slide in an old broom handle to give him the extra arm span. When the scarecrow was set up it looked good, the arms stretched out with some of the sleeves hanging down so it would move in the breeze, I was quite happy. But when I started to research the humble scarecrow I saw quite a few pictures with birds perched on the scare crows, which didn’t fill me with confidence. Also other peoples experiences with scarecrows don’t tend to be favourable. I mean scarecrows have been around for centuries, and people over the last 20 years have been inventing a lot of new ways to scare birds. Would they have to if scarecrows were working? On the second day the wind must have caught the scarecrow, causing it to fall over. After fixing it up and straightening football face out he was good to go again. A few days later (around day 4) my wife came in and said she saw some birds near the scarecrow eating seed. And again on the fifth day she said she had seen more birds. Personally, I hadn’t seen any birds near the seed, and my wife does tend to be a little critical of my endeavours, so I am cautious not to write the scarecrow off, but I must admit things aren’t looking crash hot. From looking at the pile of seed its hard to tell if some is missing due to the birds or it is washing away, as we have had a storm pass through the other day. The jury is still out. On day 9 there was a bit of a storm and the scarecrow got knocked over again. While I was fixing it, which only took a minute, I started to think about how the scarecrow was going. I was seeing birds around the backyard, but not around the area which I had the seed in. The pile of seed still had some seed in it, but not as much as I put there. I have been sticking my head out and watching for birds over the last week and a bit, but I haven’t caught any in the act, like some of the other methods. I will keep trying to scarecrow with some new seed, until im more sure. After trying the scarecrow with some more seed i did notice there was seed still there after a week. I have the scarecrow very close to the seed and it seems to be working! who knew! The scarecrow is good because its cheap and it can look novel if done correctly. Although I did find myself fixing it a few times, if you were serious you would plunge a wooden stake deep into the ground. The scarecrow is also very one dimensional. It doesn’t make noise, or move really (mine didn’t).